2005 HINO 268 577k miles, manual transmission (6speed) 24’ box truck Liftgate on truck Truck GVWR 25950 (Does not require CDL) THIS IS A PRE EMMISSIONS ENGINE NO DIESEL PARTICULATE FILTER BEST INLINE 6 CYLINDER ENGINE BUILT BY TOYOTA DIESEL. HINO JO8E (inline 6 cylinder diesel 229hp) Eatenton Fuller 6 speed manual trans New head gasket 2017 New injector sleeves New injector o-rings New valve cover gasket New turbo replaced 2016 Transmition completely rebuilt in 2015 New clutch in 2015 while rebuilding trans All new wheel/hub seals New break pads front & rear New rear brake caliper All new brake rotars front 2016 & rear 2017 New ac compressor in 2017 New radiator & antifreeze in Dec 2016 New clutch fan Dec 2016 New intercooler for turbo June 2017 Read end gear fluid replaced 2016 Tires are all in good condition Rotella oil & filter change every 10-12k miles Fuel filter changed every 20-25k miles New suction control valve for fuel pump 2018 Truck also has a sleeper built in for those longer trips when you need to rest. 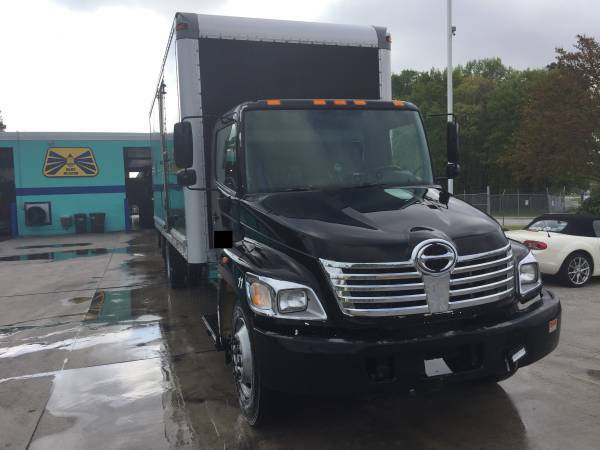 Liftgate operates & can lift up to 3500lbs Truck has NEVER been wrecked or totaled Clean & clear GA Title in hand Serious buyers only please Call 678-2nine4-three96one. Tnx Freightliner international cummins isx Detroit Toyota diesel semi tractor Volvo expedite dodge hot shot.